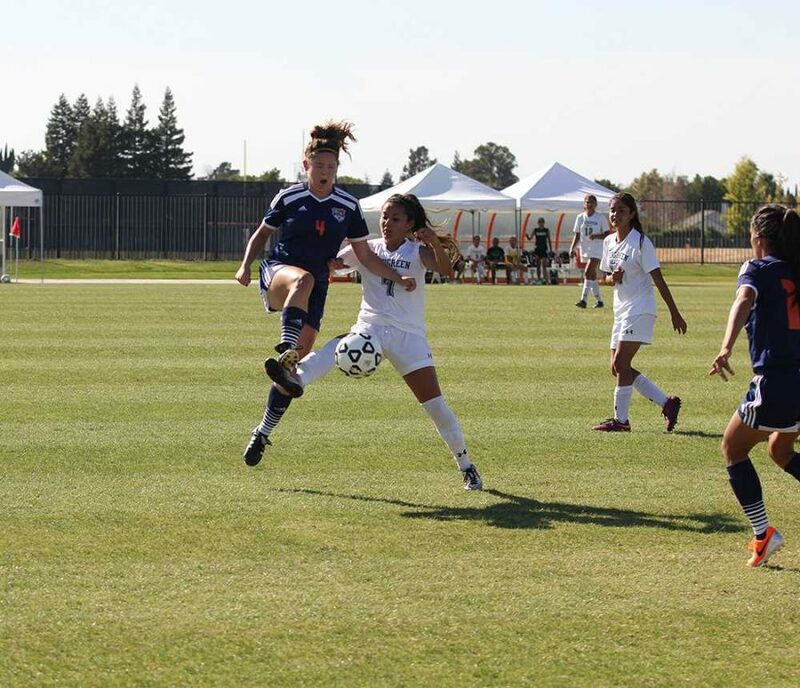 CRC Hawks freshman midfielder Kate Burkhardt leaps into the air for the ball, connecting with an opposing player from Evergreen Valley College Hawks. Burkhardt and her team defeated the EVC Hawks 4-3 but the close game underscores the rough season start for the team. 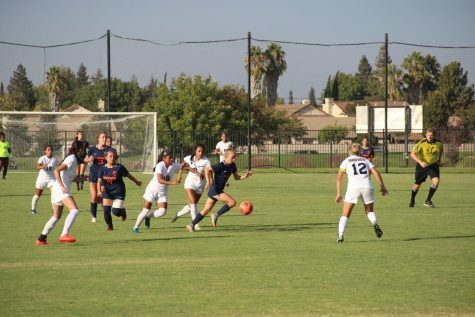 The Cosumnes River College women’s soccer team is having a less than desirable start to the sea-son, but the team isn’t letting it get them down. The season kicked oﬀ on Aug. 29, and since then they’ve had two losses and two ties. 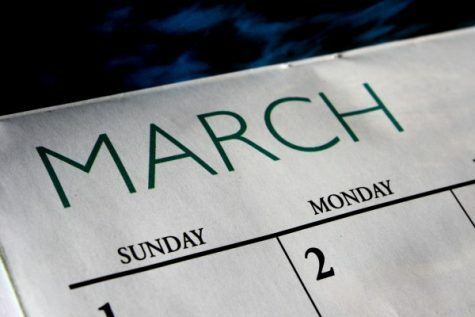 “You know, we have a tough schedule and we haven’t addressed it very well yet. We had two losses and two ties in our [ﬁrst] four games, so [we’re] not [doing] as well as we would like, but we have played high quality opponents,” said Cesar Plasencia, the team’s head coach. Freshman midﬁelder Marissa Lopez said continued practice would help the team through the rest of the season. “I think after we have a lot more practice and bonding, the team will get better and we’ll come together and play very, very well,” Lopez said. 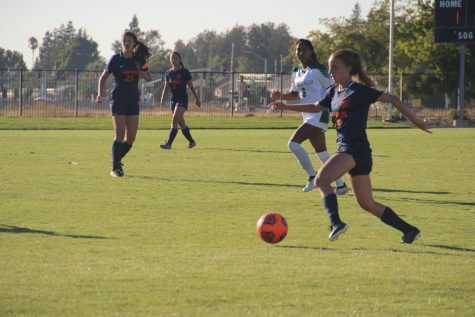 Although the 2014 season has had a bumpy start, the team did make it to the third round of the California Community College Athletic Association Nor Cal regional playoﬀ s last year and said they hope to do so again. Plasencia said the team will absolutely make the playoﬀ s once again this season. With their ﬁrst conference game on Sept. 23, the women said they are feeling conﬁdent about the outcome. 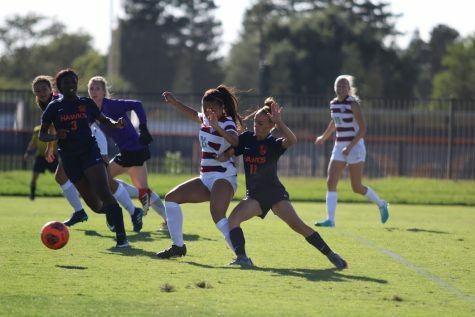 “I think as we keep practicing and playing together it’s gonna click and we’re going to be able to soundly go on the ﬁeld and win,” said sophomore defender Allison Krebs. Jena Mamola, a sophomore defender, said there was some late starting with training this summer. “We had two weeks of straight training, no scrimmages or anything. Something happened and we couldn’t do anything over summer so we started late and since then we’ve [been] doing a lot of tactical stuﬀ ,” Mamola said. Most of the team said freshman midﬁelder Kate Burkhardt was their player to watch as the season progresses. “She is one of the players that you know is going to come in every game and make a diﬀerence,” said Martin. Freshman forward Hanna Doughty said that the team chemistry is strong. Plasencia said he is not letting the scoreboard dictate the rest of the team’s season.